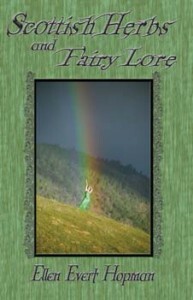 Ellen Evert Hopman’s latest book is called “Scottish Herbs and Fairy Lore”. This title really doesn’t do the book justice, however I suspect Pendraig Publishing would have found the title “Absolutely Every Damn Thing EVER about Scotland” to be a hard title to live up to. Of course, they would be wrong. The book starts with “A Note to My Readers” that says, “This book contains folklore, magic, and traditional practices from all areas of Scotland; from the Highlands and Lowlands to the Hebrides, Orkney and Shetland.” This was my first clue that the always thorough Hopman was going to working overtime sharing everything Scottish. Right now I sit at my keyboard overwhelmed by the breadth of information “Scottish Herbs and Fairy Lore” imparted. Where on earth to begin? I guess we should start at the beginning. To help give readers a sense of context Hopman starts with what she calls “A Thumbnail Ancient History”. In an easy to follow, compact form, she manages to share with readers the Picts, the Celts, Hadrian’s Wall, the influence of the Vikings, the arrival of Anglo culture, the Battle of Nechtansmere, and more. From there it flows smoothly into discussing the rest of traditional Scotland. I hate to do this, but it will really give you guys a great idea of how all encompassing “Scottish Herbs and Fairy Lore” truly is, here is the “Table of Contents”. The Druids, The Old Gods, Lore of the Elements (which includes information about water, fire, and earth magic), Stones, Bones, and Talismans, Holy Days and Holiday (with recipes for the holidays! ), Life Passages (such as marriage, childbirth, and death), Divination Practices, A Highland Herbal (where you’ll find those Scottish herbs from the title of the book), Fishing Magic, Boats, and the Lore of the Sea, Farming, Fertility, and Harvest Customs, Domestic Life (like food and whisky), Sacred Birds and Animals, Magical Practices (which features rituals, healing and protective magic, curses, and more), Elves, Spirits, Witches, and Monsters, and The Fairies. I know, right? Whew! Hopman does an excellent job propelling the reader through a diverse range of topics in 272 pages, which includes an appendix of a pronunciation guide and the bibliography. What’s even better is that the book is thoroughly indexed! When you have that much information you’re going to want to refer back to the text for specifics from time to time, and thankfully, unlikely many books, “Scottish Herbs and Fairy Lore” has 36 pages of index which means you will definitely find what you’re looking for! Previous postWhat is New Age Music? And the New Paul Avgerinos Album.